We’d love your help. 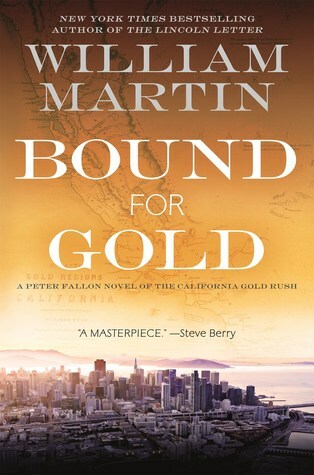 Let us know what’s wrong with this preview of Bound for Gold by William Martin. To ask other readers questions about Bound for Gold, please sign up. William Martin remains one of the most accomplished purveyors of historical fiction today. In his new novel, BOUND FOR GOLD, the sixth in his Peter Fallon series, the Boston book dealer and his girlfriend Evangeline Carrington become caught up in the search for a lost journal that will transport them to the mid-nineteenth century California gold rush. Employing his traditional approach of alternating historical information from a specific period with the present Martin has written an engrossing William Martin remains one of the most accomplished purveyors of historical fiction today. In his new novel, BOUND FOR GOLD, the sixth in his Peter Fallon series, the Boston book dealer and his girlfriend Evangeline Carrington become caught up in the search for a lost journal that will transport them to the mid-nineteenth century California gold rush. Employing his traditional approach of alternating historical information from a specific period with the present Martin has written an engrossing novel that is based on sound historical research and a novelist’s eye for fine detail. BOUND FOR GOLD is the kind of epic saga readers can get lost in. Martin's series character, Peter Fallon, is still at the top of his game, but the book's real fun is in its history of old California. I have read a couple of William Martin's books in the past and after finishing this one I plan to go back and read some more. A wonderfully written historical fiction of the California Gold Rush era, the men and women who gambled all for the elusive pull of easy wealth in a territory that was anything but easy. The past and the present co-mingle as rare book dealer, Peter Fallon journeys back to that time via journals left by a man who lived it. One question kept going through my mind as I read t I have read a couple of William Martin's books in the past and after finishing this one I plan to go back and read some more. A wonderfully written historical fiction of the California Gold Rush era, the men and women who gambled all for the elusive pull of easy wealth in a territory that was anything but easy. The past and the present co-mingle as rare book dealer, Peter Fallon journeys back to that time via journals left by a man who lived it. One question kept going through my mind as I read this...Do we ever learn from history? Think God for good, caring, compassionate people. Bill Martin at his best. The breakdown of civilized behavior among the Boston gentlemen catching the gold fever of 1848 is evocative of Lord of the Flies. A dual story a manuscript sleuth Peter Fallon searches for an old manuscript that purportedly reveals a hidden gold vein. Fallon and conflicted girl friend dives into the seamer side of SF China town who resort to .......to stop Fallon's search. Two historical novels wrapped together with characters you will hate or love but never don't care. Bill Martin at his best. The breakdown of civilized behavior among the Boston gentlemen catching the gold fever of 1848 is evocative of Lord of the Flies. A dual story a manuscript sleuth Peter Fallon searches for an old manuscript that purportedly reveals a hidden gold vein. Fallon and conflicted girl friend dives into the seamer side of SF China town who resort to .......to stop Fallon's search. Two historical novels wrapped together with characters you will hate or love but never don't care. Thank you to NetGalley for an advanced copy of Bound for Gold, in exchange for an honest review. Once again, William Martin has started off a book that engages from the beginning. Back & forth, between the gold rush era in California to present day, the story winds around & around, until coming together full circle. I enjoyed reading the latest Peter Fallon novel & look forward to the next. I would recommend this book for readers of historical fiction. Bound For Gold is an enjoyable well-researched novel. I loved it and learned a lot. A band of entrepreneurs decide to incorporate in Boston to take advantage of the 1849 California gold rush. They have no idea how difficult their trip will be just to arrive. After sailing around Cape Horn under a brutal captain and finally reaching San Francisco, their company has disbanded. The protagonist, James Spencer, of Boston, falls in with an Irish rogue who eventually saves his life and becomes a truste Bound For Gold is an enjoyable well-researched novel. I loved it and learned a lot. A band of entrepreneurs decide to incorporate in Boston to take advantage of the 1849 California gold rush. They have no idea how difficult their trip will be just to arrive. After sailing around Cape Horn under a brutal captain and finally reaching San Francisco, their company has disbanded. The protagonist, James Spencer, of Boston, falls in with an Irish rogue who eventually saves his life and becomes a trusted friend. How this comes about is a big part of the story. Martin has read journals of the era and shares what it was like to stake a claim and succeed as a prospector in those times. Greed, betrayal, love, ruin all play a part. And few succeeded in extracting enough gold to make a profit. Rarely does a book come along that has me as emotionally involved as Bound for Gold. William Martin opens his novel with the 1906 earthquake and fire that destroyed much of San Francisco. James Spencer, a wealthy merchant, is desperate to get through to his office to retrieve the seven journals that document his journey from Boston as a member of the Sagamore Mining Company to search for gold to the position that he now holds. In the present Peter Fallon, a rare books dealer from Boston, is asked Rarely does a book come along that has me as emotionally involved as Bound for Gold. William Martin opens his novel with the 1906 earthquake and fire that destroyed much of San Francisco. James Spencer, a wealthy merchant, is desperate to get through to his office to retrieve the seven journals that document his journey from Boston as a member of the Sagamore Mining Company to search for gold to the position that he now holds. In the present Peter Fallon, a rare books dealer from Boston, is asked to come to San Francisco to do an evaluation on the library of books that belong to the Spencer estate. Spencer’s last great-granddaughter recently died. In her will she specified that the estate not be liquified until Spencer’s seven journals, distributed among his descendants, were re-united. There are those that believe that re-uniting the journals could start a new gold rush and are reluctant to give up their copies to preserve the land. While Fallon’s search leads to encounters with the FBI and the Chinese mobs, it is the contents of the journals themselves that fascinated me. The perilous sail from Boston to California started with the men of the mining company in good spirits anticipating the fortunes to be made but months at sea and confronting the conditions when they land in California creates irreversible divisions among the men. The brutal conditions, prejudices and hostility that they encounter are recorded in the journals and news dispatches that Spencer sent to Boston. Martin also populates his novel with memorable characters. Spencer stakes his claim with Michael Flynn, a free-spirited Irishman whose love for a Chinese woman leads to tragedy, and Cletis, the army veteran who is often the voice of reason and holds them all together. There is also a strong female character in Janina, the woman who Spencer left behind in Boston. She makes her own way to California and stands by Spencer’s side as he builds his business. Theirs is a story that you will hate to see end and one that will stay with you long after you finish reading. This author is coming to NPL on December 12th. Good read. I would like to thank the author for a great story with realistic characters. Mr.Martin is the king of historical fiction and this was the best yet! I won this book in a good reads giveaway. It is an awesome read! Two stories from different times intertwined; both of which are captivating! Definitely worth the read, even had a tear at one point. This review has been hidden because it contains spoilers. To view it, click here. Another in a series where a Rare Book Collector and his girlfriend track down a set of mysterious journals and get caught up in trouble. Think of Clive Cussler without the boats or Steve Berry and you will have some idea of who will appreciate these books. This time they are searching for some lost journals of a gold prospector in the early days of the California Gold Rush and solving the mystery could just mean finding the second Gold Rush. William Martin gives you a modern-day thriller with a s Another in a series where a Rare Book Collector and his girlfriend track down a set of mysterious journals and get caught up in trouble. Another in a series where a Rare Book Collector and his girlfriend track down a set of mysterious journals and get caught up in trouble. I won this book on Goodreads. This book was awesome. I could hardly put it down. A must read. William Martin does it again with his latest in the thrilling Peter Fallon series. Martin’s impeccable research and masterful story telling come together to give the reader a full fledged journey into the history of the California gold rush. Like so many of Martin’s books, I couldn’t put this one down. It’s truly brilliant, and I can not recommend it enough. I just finished reading Bound for Gold and of the 6 novels starring Boston rare book dealer Peter Fallon and his girlfriend Evangeline Carrington, this was my favorite and really showed off the best of William’s writing, this is the book all of his will be compared to from here on out, it’s just that amazing! Like all of the books in the Peter Fallon series, there’s 2 stories happening, 1 involving a treasure from history usually about 200 years ago and how it ends up to be in the present day w I just finished reading Bound for Gold and of the 6 novels starring Boston rare book dealer Peter Fallon and his girlfriend Evangeline Carrington, this was my favorite and really showed off the best of William’s writing, this is the book all of his will be compared to from here on out, it’s just that amazing! Like all of the books in the Peter Fallon series, there’s 2 stories happening, 1 involving a treasure from history usually about 200 years ago and how it ends up to be in the present day where Peter is involved. Up until this one, I’ve always been more excited about Peter’s story than the past, but this time, William does such an impeccable job bringing the California gold rush to life, that I was as equally excited to read all about James Spencer’s adventures back in the 1850’s as I was to read about Peter’s hunt for the Spencer journals. The amount of description and detail he used to create California for James Spencer back in the 1850’s is some of William’s best writing yet. 1 other thing is that this is by far the most suspenseful of the series and this was the book I had the hardest time to put it down. This was the 1st book I ever pre-ordered knowing I would be off work for a few days and I binged read it. Each of the Peter Fallon series books can be read individually as it’s own story, but as soon as you start reading about Peter, you want to go back and learn his whole story and start at the 1st one. You won’t be disappointed since each story gets better and better and hooks you in. So, Bill's done it again! He said I'd like it, and he was right! Lot of research went into it, and on a subject I knew little or nothing about, so it was pretty interesting. I loved Cletis the most. I'm thinking lawlessness was almost preferable to the laws they did come up with.....! As much as I'd like to talk about it, I don't want to give anything away! The big question, is there still gold in them thar hills? I recently had the pleasure of hearing Mr. Martin speak at a bookstore in Massachusetts. He talked about his research, well done, while writing this book. I have read all the others in this series and was surprised about the time period and event he chose for this book. A must read for anyone who loves reading books by this author. Excellent and well written story. Bill Martin has an uncanny ability to transport his readers back in time so that they feel they are really living in the historical moment. In this latest novel, he brings to life the California gold rush. A thoroughly researched page turner. Excellent book. Great story and great characters. Highly recommended. Couldn’t put this book down. Great story within a story. Thorough descriptions re life and times during the California Gold Rush. Love able and hateful characters. Author draws you in, building suspense, twists you heart back and forth, then ends with a heartwarming, emotional climax! A wonderful book. It is no surprise that Bill Martin is the author! This era of history has never been very appealing to me, but I love the format of William Martin's books, telling two parallel stories from different time periods. I was not disappointed. Once again, a great story based on loads of historical research. Brilliant! What a great read! There's plenty of tension, suspense, and surprises. Martin weaves a tale around pillars of historical fact. As the reader, we get (whether we like it or not) an up-close look at what it was like in mid 19th century Gold Rush California. This tale is so believable it's hard to accept it as fiction.